For a great alternative to smoked salmon on bagels, try these simple one bite appetizers. In a small bowl, mix cream cheese, sour cream, lemon juice, lemon zest, capers, horseradish, green onion, dill, salt and pepper. On a cutting board, lay slice of smoked salmon. 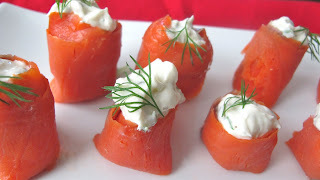 Take 1 Tablespoon cream cheese mixture and put at edge of salmon. Roll salmon to the end and press edge. Cut off bottom of salmon so edge is level. Repeat with remaining salmon. Stand on serving plate and garnish with fresh dill.